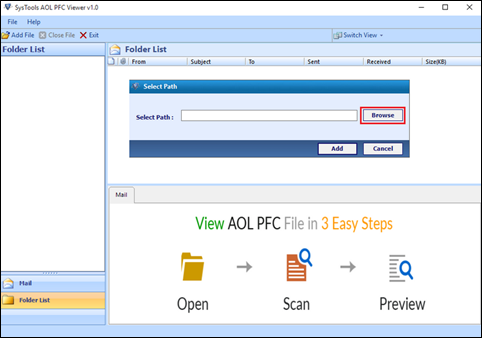 The AOL PFC Viewer can be used for viewing Personal Filing Cabinet files, once the data is loaded into the software. It not only view and open PFC files but also their associated attachments. User can select any email with attachment and view the internal attachments for the respective selected PFC email. After the files are successfully loaded into the PFC Viewer Software, a preview list is generated for the users. By the help of this PFC File Viewer, a complete preview of entire PFC AOL emails along with details like To, Sent, date, subject, size of mails in KB, etc. is displayed on the screen. The PFC File Opener tool is such a proficient tool that maintains a proper folder structure while it view and open PFC files. This tool will keep every file or folder of PFC emails like sent, received, deleted, drafted, etc. in a hierarchical order. Thus, the data integrity will always be maintained in the files. AOL PFC Reader is a tool which is designed keeping in mind all the Windows users as it is compatible with all Windows OS. This free utility runs smoothly with Windows 10 and all other below versions. This tool is a perfect solution to view AOL PFC files in a time efficient and reliable manner. How can I open PFC file without using AOL, if i have downloaded a file in PFC format? 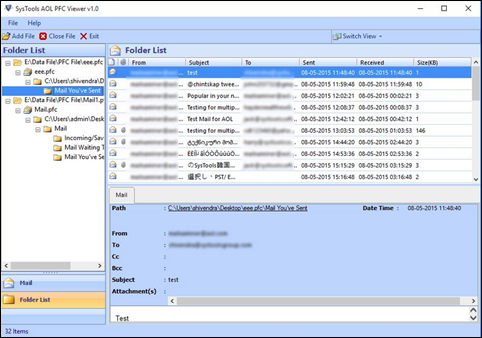 PFC File Viewer is best choice for viewing your email files. AOL desktop application is just not required to view the PFC files. Presently, I am operating on AOL 9.0 version but after I have upgraded to the newer version of AOL my PFC is not working. I urgently need my saved emails of 4 years. All I want now is to view PFC (Personal Filing Cabinet) emails. Let us tell you that in case you have archived your AOL emails into PFC then, presently the tool is under development. But if you own an AOL Webmail i.e. if it is there on server, you can directly save emails from the AOL server through the above recommended PFC Viewer tool. I want to view favorites from my AOL PFC email files but it is just not opening up for me. Is there a quick and easy solution so that I can view AOL PFC file without using AOL? I have saved multiple PFC in my AOL mail. How do I view saved mails from my AOL mail? 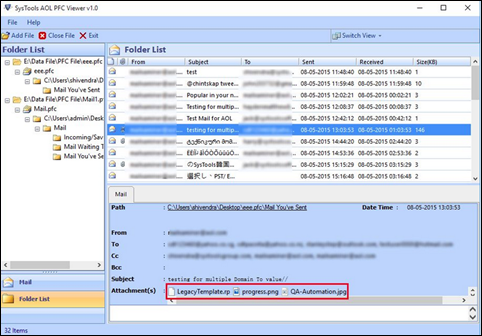 Saved mails in AOL can be easily viewed by the help of AOL PFC Reader tool. How can I access linked attachments from PFC File? Does the PFC viewer show the attachment of the PFC emails? No, your attachment would not be accessible by this PFC Reader tool. The software will maintain the internal attachment but not the external attachment. You can only view the name of the attachment along with its file extension. Download and launch the PFC File Viewer software. 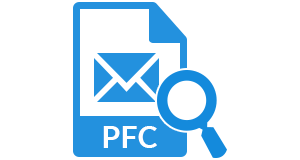 Click on Browse to select the desired PFC files and click Add. The tool will also preview corresponding Attachments of PFC email files. "Trust me! It was such an impossible task for me to read AOL PFC email messages locally on my hard drive. But since I have used your product PFC Viewer, I am able to open any kind of PFC files without any interruption. I can view all the email messages from the PFC file without even installation of AOL in my system. Thanks a lot to your developing team for innovating such an awesome tool!" "Firstly, I want to convey my immense thanks to the developing team for such a creation! This tool gives such a great performance. The precision with which the AOL PFC Viewer software works is simply outstanding! It provides a reliable way to access PFC file format. I am more than happy with the upgraded version of the AOL PFC Viewer."